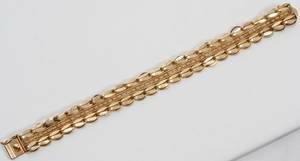 Double rope link 14K yellow gold bracelet with diamond encrusted buckle, approx. 0.60 ct. 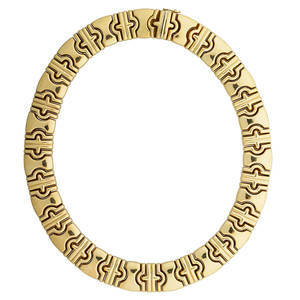 twt., 21.5 dwt., 8 1/2" l.
"parenthesis" link 14k yellow gold necklace concentric puff link collar, ca. 1980. 17" x 3/4". 61.4 dwt. 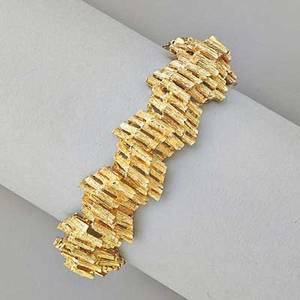 050189: 14K YELLOW GOLD BRACELET, 21 GRAMS, L 8"
Modernist 14k yellow gold bracelet; textured reed-like links, ca. 1960. 8 1/2". 42.2 dwt. 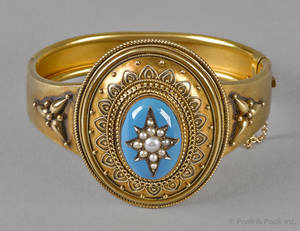 Hindu motif 14k yellow gold bracelet; embossed solid links depict durga and lion. 7 1/2" x 1 3/8". 83 dwt. 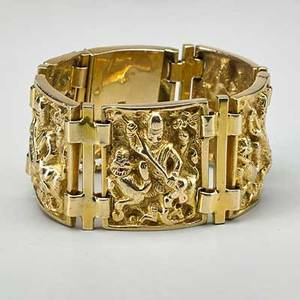 040360: ITALY 14K YELLOW GOLD BRACELET #518551`, L 7"